When March 17 comes around, there's no better way to celebrate than with an unforgettable, frozen concoction-packed bash. With on-point decorations and frozen treats made with your Margaritaville® Tahiti™ Frozen Concoction Maker®, you can throw a St. Patrick's Day party that's as good as gold. For St. Patrick's Day, you want the party decor to be bright and cheery. For a unique party, incorporate tropical touches into your St. Patrick's Day decorations. Inflatable palm trees fit right into the color scheme, as do green, orange and gold artificial flowers, paper lanterns and string lights hung around the room. Wide streamers in an array of colors pinned to the wall can create a rainbow - one that leads to a table of frozen concoctions, of course. Another fun idea is to stick green balloons together so that they form four-leaf clovers and attach them to the wall. Paper horseshoe garlands and leprechaun hats also make the space fun and festive. Turn on some Celtic music too to keep the fun and energy going all evening. At your St. Patrick's Day party, have guests follow the rainbow to a collection of delicious frozen concoctions. You could even give your tiki bar a merry makeover, with gold coins scattered across the counter and green streamers wrapped around the bar stools. 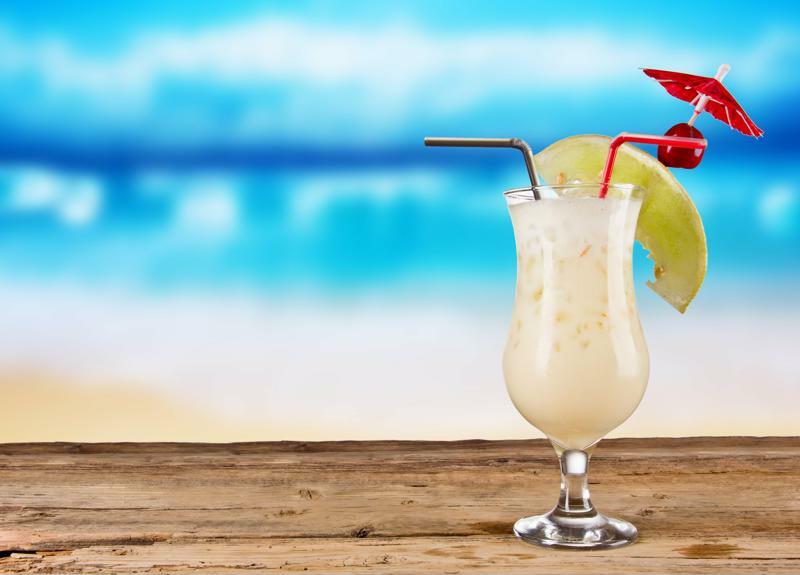 For the frozen concoctions, mix up recipes inspired by the holiday, like Tropical Leprechauns, Emerald Isles, Green Iguanas, Off to See the Lizards or decadent Dew Drops. Depend on the Margaritaville® Tahiti™ Frozen Concoction Maker® to keep party guests happy during the St. Patrick's Day festivities. The Tahiti is an impressive fully automatic frozen drink bar that can make up to 72 ounces of three different kinds of frozen concoctions, to make sure there's no slowdown in the party while your work on refills. Get creative with the drink glasses and garnishes to add some holiday-ready whimsy to party, too. Serve the concoctions in goblets or large "gold" cups, and have chocolate sauce, whipped cream and lots of green-colored garnishes on hand, like chopped pistachios, kiwis, green grapes, melons cubes or even chopped jalapeños to add a feisty and spicy kick to frozen concoctions. Make your piña colada more festive with a dash of Irish cream. Have lots of tasty bites on hand to keep guests' appetites at bay during the party. For the main course, serve a big pot of beef stew and corned beef and cabbage sliders, which are a clever take on a traditional Irish meal that's party-ready. Set up a dessert bar where guests can make all their sweet wishes come true - fill tall glass jars with green treats like jelly beans, green chocolate-covered pretzels, sour candies and licorice. Dip for chips can be served in a large black pot, and a tray of chopped fruits and vegetables arranged in a rainbow can help guests refresh between sweet treats. Your St. Patrick's Day party should be all about letting loose with friends and family and enjoying good times and fun. First, set the dress code to be green and gold, and remember: The more festive and over-the-top, the better! During the holiday bash, keep the party going by celebrating with games like horseshoes, or have a contest tossing chocolate coins into a pot placed across the room. You could get guests searching for treasure with a scavenger hunt, hiding small goodies and leaving witty rhyming clues in hidden places. Another fun game idea? Set out ingredients and have your guests take a crack at creating their own St. Patrick's Day-themed frozen concoction recipes. Have them vote on their top three recipes, then make all three in the Tahiti. Guests can then vote on their favorite drink out of the three to determine the ultimate winner - who receives a treasure chest of candies or other tasty treats as an award.